Ever drive through Lexington and get seduced by the road side stands? You know, the ones screaming “LEXINGTON STRAWBERRIES!” at you? You can smell the berries from the road. The shops set up for a short while each year and then disappear so it is important that you buy your berries and get your year’s full in just a short month or so. The natural inclination is to make dessert. * This is 10 more ounces of berries than will be used in the pie, to account for any imperfect strawberries. ** Be sure to use Sure-Jell for low- or no-sugar recipes (pink box) and not regular Sure-Jell (yellow box), otherwise the glaze will not set properly. To make the filling, select 6 oz. misshapen, under-ripe or otherwise unattractive berries, halving those that are large, about 1½ cups. In the food processor, process the berries to a smooth puree. You should have about ¾ cup puree. In a medium saucepan, combine the sugar, cornstarch, Sure-Jell and salt. Whisk to combine. Stir in the berry puree. Cook the mixture over medium-high heat, stirring constantly, and bring to a full boil. Boil for 2 minutes, scraping the bottom and sides of the pan constantly. Transfer to a large bowl and stir in the lemon juice. Let cool to room temperature. Meanwhile, pick over the remaining berries and measure out 1 pound, 12 ounces of the most attractive ones; halve only extra-large berries. Add the berries to the bowl with the glaze and fold gently with a spatula until the berries are evenly coated. Scoop the berries into the pie shell, piling into a mound. If any cut sides face up on the top, turn them face down. Refrigerate the pie until chilled, about 2 hours. Serve within 5 hours of chilling. Make the whipped cream just before serving. Whip the cream and sugar on medium speed until small bubbles form, about 30 seconds. Increase the speed and continue beating until medium peaks form. Cut the pie into wedges and serve with whipped cream. 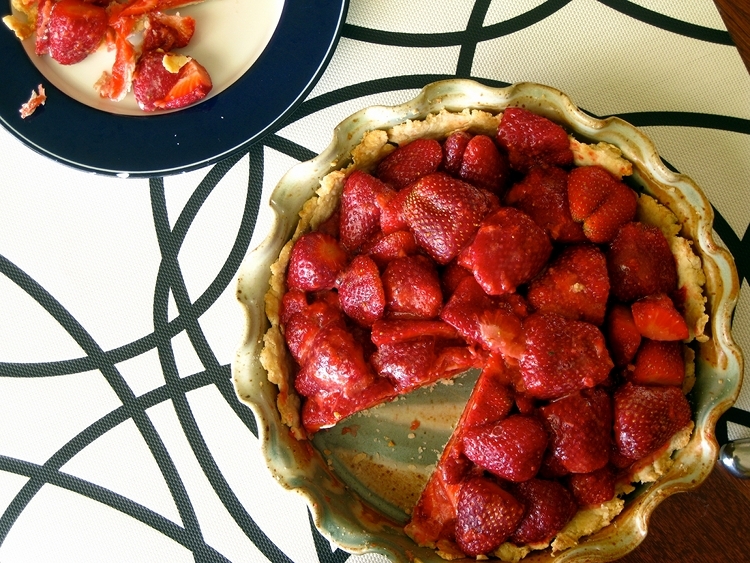 This pie is a lovely one and highlights berries at their peak. Some recipes call for strawberry jam or preserves, which is a total cop out, in my opinion! 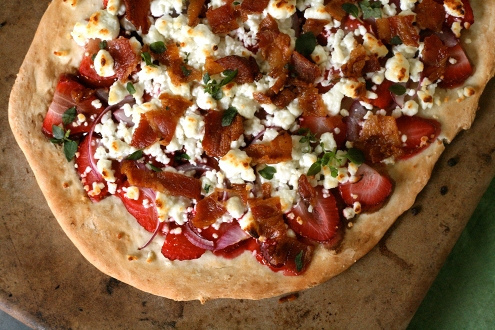 While the pie is great, let me introduce you to a crazier, but more delicious recipe: Strawberry Bacon Goat Cheese Pizza. Roll pizza dough out into a 12 – 14″ round. Using a pastry brush, apply balsamic vinegar to entire surface of the pizza dough. Top dough with sliced strawberries and then the red onion slices. Distribute goat cheese all over dough and then cover in crumbled bacon. Bake 12 minutes or until done. Sprinkle with basil leaves and serve warm. This entry was posted in Brady Evans Venables, Columbia, Famously Hot, Food, Lexington, Lexington Medical Center, Midlands, Recipes, Women and tagged Brady Evans Venables, Columbia, columbia sc, cooking, every woman blog, Famously Hot, food, Fresh Strawberry Pie, hospital blog, Lexington, lexington medical center., lexington sc, Lexington Women, lmc, LMC every woman blogger, Midlands, Midlands Women, Recipes, South Carolina, South Carolina Women, Strawberries, Strawberry Goat Cheese Pizza Bacon, Strawberry Pie, Women, women's blog, women's hospital blog by Ashley Andrews. Bookmark the permalink.